Welcome to the San Francisco Chapter of the Association of Certified Fraud Examiners Spring Conference 2019.This day long training will be packed with presentations, panel discussions and keynote speeches from the Anti-Fraud community, as well as government regulators and enforcement agencies (TBA). Earn up to 8 CPE’s including 2 Ethics CPE’s! The overarching theme of this years conference will be to discuss the importance of Innovation in the anti-fraud space. This will include the discussion of new training techniques, new technology to support training and new approaches to fighting fraud. 9:15-10:30: The Seduction of Fraud – Understanding the Draw to the Dark Side! Presenter: Kamal Hubbard, Co-founder of AltMarket, Inc. Earn up to 8 CPE’s! The cost of the training will include breakfast, lunch and refreshments throughout the day. The event location is a 5 minute walk from Embarcadero Bart or the CalTrain SF station. We hope that the timing and location of the event will help those living and/or working outside of SF to attend this exclusive event. We would like to extend a special thank you to EY for their sponsorship of this event! Welcome to the San Francisco Chapter of the Association of Certified Fraud Examiners Fall Conference(s) 2018.These day long training(s) will be packed with presentations, panel discussions and keynote speeches from over 15 experts in the Anti-Fraud community, as well as government regulators and enforcement agencies. Earn up to 8 CPE’s! The online gaming and gambling are $150+ billion industries and experiencing exponential growth. Tradional media is being replaced by the likes of Youtube and online streaming sites. Many of these new ways to communicate and interact with one another are also the new spawning grounds for online fraud and other criminal activities. Cyber-criminals joining forces with traditional fraudsters and even terrorists to leverage this new frontier. Join us talking with experts from organization including: EY, Linden Labs, GoFundMe,ThreatMatrix and many more to discuss state-of-the-art ways to combat fraud, money laundering and other bad actors online. We will be offering both a San Francisco (9/14/2018) and a San Jose (9/26/2018) location. Please be careful to register for the correct date & location! Sessions will cover similar topics but there might be a variation in actual speakers. As we move closer to the actual conference date, we will be updating the speakers on our website. 10:30-12:00: Why Fighting online and mobile payment fraud is like fighting zombies! Looking to the future, visions of online payments and fraud in 2025 and beyond. A Chief Compliance Officer who has success in guiding companies through the process of obtaining money transmitter licenses worldwide. Scott designed the compliance program for Facebook’s peer-to-peer (P2P) money transfer feature (“Payments on Messenger”) and established Facebook’s first company-wide system for monitoring developments in sanctions regimes that affect products/features across the Facebook platform. He handled key aspects of the Facebook payments subsidiary’s first-ever regulatory examinations before eventually taking full responsibility for those exams. At Linden Lab, he is charged with making sure that transactions that take place in a “virtual world” meet regulatory and legal requirements without inhibiting customer experience. I’ve found that my experience working for compliance departments on Wall Street (Deutsche Bank and Credit Suisse) provided regulators and business partners with the comfort that the AML/CTF programs that I established were fundamentally sound. Applying my traditional regulatory knowledge to the non-traditional FinTech environments has been my speciality. He is also a screenwriter and have consulted on a number of financial crime/fraud-related film projects. Yes, that’s a lot of titles. But, at the core of all of the projects I work on are merchant focused, in the CNP fraud & payments industry. After spending 6 years of my career in payments and fraud operations for a payment processor, a retailer with a unique business model and one of the largest online travel agencies, I found my real passion was supporting merchants, to help them do their job better or to work on changing the industry. I’ve done that in a variety of ways for the last 7 years. -Through consulting directly, through being the in-house industry expert for the main trade association for risk & payments professionals, through creating conference & written content for a large industry conference, through podcasting & sharing some of the knowledge I have about this industry I love. I’ve been fortunate enough to work with the largest companies in the world while learning which strategies and tools work best for each business model and vertical, to provide significant savings to online companies of all sizes & verticals, to speak at several conferences, and many other great experiences. -All of this to advocate for or to support online and mobile merchants in fraud prevention and payments optimization. I get to work on fighting fraud on the largest real-time fraud detection platform daily. I help customers review suspicious activity and complex fraud cases to help identify and resolve fraud risk trends and issues. Helping e-commerce websites and financial institutions fight fraud in New Account Origination , Logins, Detail Changes, Shipping Fraud, Payment Fraud. ThreatMetrix®, A LexisNexis® Risk Solutions Company, empowers the global economy to grow profitably and securely without compromise. With deep insight into 1.4 billion anonymized user identities, ThreatMetrix ID™ delivers the intelligence behind 100 million daily authentication and trust decisions to differentiate legitimate customers from fraudsters in real time. ThreatMetrix is recognized as the sole Leader in the 2017 Forrester Wave™ for risk-based authentication. Paul Wang is a proven leader in the anti-fraud and AML space within fintech, with expertise in customer verification, and due diligence. He has extensive experience in preventing fraud across both the P2P lending and crowdfunding space, and has successfully developed fraud-prevention operation teams. Paul currently serves as payment risk manager at GoFundMe, leading a team to protect users on the largest and most trusted crowdfunding platform in the United States. Earn up to 8 CPE’s! The cost of the training will include breakfast, lunch and refreshments throughout the day. We hope that the timing and location of the event(s) will help those thoughout the Bay area to attend these exclusive events. We would like to extend a special thank you to Ernst & Young (EY) and Frank, Rimerman (FRCO) for their sponsorship of these events! Presenter: Natasha Williams, CFE, Bio-Rad Inc.
1:30-2:15 p.m. Panel Discussion: Ask the Experts! We are pleased to announce that the San Francisco Chapter of the ACFE will hold our next meeting on Monday, November 13, 2017 from 11:30am-1:30 pm. Our meeting will be a combination of Chapter meeting and a special lunch n’ learn presentation with Stephanie Douglas of Guidepost Solutions on “Insider Threats”. (2 CPE’s will be awarded). A box lunch will be provided to all registered attendees. I would also like to give a special thanks to Golden Gate Universityfor stepping up as our main sponsor for this event. Managing risk in today’s business environments requires a good understanding of the threats which exist outside our organizations but also those that exist within. The Insider Threat is composed of both intentional and non-intentional actors and accounts for approximately 40% of the data breaches and almost 80% of the thefts of intellectual property which occur within our organizations. Understanding your organization’s risk and having some common sense tools to mitigate it, is the first step to developing a successful Insider Threat strategy. Ms. Douglas has a distinguished career in both private and public sectors. She retired as a Senior Executive from the Federal Bureau of Investigations in 2013 and was recruited by Pacific Gas & Electric. Serving as its Senior Director of Corporate Security, Ms. Douglas oversaw risk mitigation and issue response.In her 23 years at the FBI, Ms. Douglas served in a variety of influential roles. In her last role with the FBI, she served as Executive Assistant Director of the National Security Branch. There she directed all of the FBI’s work related to domestic and international counter-terrorism, counterintelligence, weapons of mass destruction and intelligence matters, which included oversight of the Terrorist Screening Center. In this position, she reported to both the FBI Director and the Director of National Intelligence (DNI). Ms. Douglas represented the FBI in discussions of national security policy along with other US Intelligence Community partners. As part of her management responsibilities, she also oversaw both funding and personnel resources for the national security mission of the FBI and served as the Bureau’s Chief Intelligence Officer.Prior to the above position, Ms. Douglas served as the Special Agent in Charge for the FBI’s San Francisco Division for over three years. In this position, she led all investigative and administrative operations of the division including those focused on white collar crime violations. Free of Charge for ACFE SF Chapters Members. The cost to non-members is $25 and will be collected at the time of registration through Eventbrite. Welcome to the San Francisco Chapter of the Association of Certified Fraud Examiners Tech Fraud Summit 2017.This day long training will be packed with presentations, panel discussions and keynote speeches from the top players in the Technology Sector / Online Anti-Fraud community, as well as government regulators and enforcement agencies. Additionally, it will feature presentations and demos of emerging fraud fighting technologies used by the largest names in technology such as Yelp, Google, StubHub, Uber, Facebook, Yahoo, Twitter, Dropbox, DocuSign, Apple, Amazon, LinkedIn, Microsoft, Airbnb, Eventbrite, Lyft, Pinterest, Salesforce and many more! We would like to extend a special thank you to Ernst & Young (EY) for their sponsorship of this event! List of tentative Speakers – Please visit our website www.sfacfe.com for speaker bios and additional information. 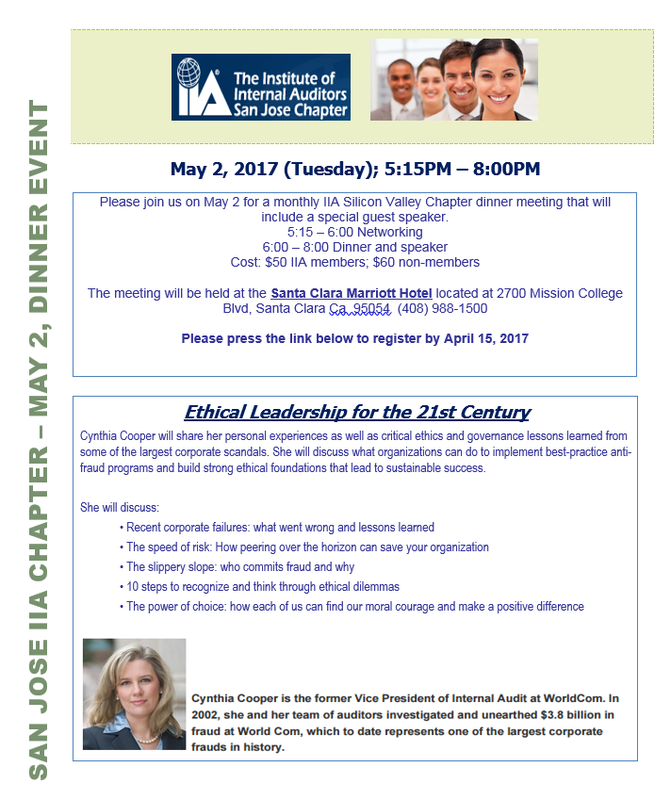 Presenter: George Totev, Atlassian Inc.
We are pleased to announce that the San Francisco Chapter of the ACFE will hold our next meeting on May 16, 2017 from 5:30-7:30 PM. Our meeting will be a combination of a micro-job fair with various organizations from the Greater SF Bay Area, and a special presentation with an outside expert in the field of recruitment and career development and professional networking. (2 CPE’s will be awarded) This will then be followed by a social time with refreshments. I would also like to give a special thanks to Golden Gate University and the Federal Bureau of Investigation (FBI) for stepping up as our main sponsors for this event. How to open up the pipeline for prospective candidates to meet and talk with hiring manages, not just the recruiters. What are the responsibilities of each; the hiring managers, the candidates and the internal recruiting teams? The challenges candidates have finding and speaking to hiring manages. The challenges internal recruiting teams have filling current roles. The challenges hiring manages have with candidates and recruiting teams. Then discuss how candidates can find and open communications with hiring manages. BRUCE POTTERTON is a co-founder of The Fletching Group, a talent identification consultancy that supports the needs of hiring managers of small to mid-size firms. He has over 25 years of executive experience managing multi-functional teams that combine strategy, sales, product and marketing. He has built and led effective teams, including recruiting employees, consultants, agencies and/or independent freelancers, for startup, turn around and high growth high technology organizations. Potterton has significant experience generating and servicing emerging to Fortune 500 clientele in a wide range of industries including, retail, financial services, bio tech, hardware and software. Potterton earned a B.A. in design from the University of Minnesota. The SFACFE would like to announce the annual ACFE Fraud Conference, which will be held in Nashville Tennessee from the 23rd to the 28th of June. If you wish to attend, registration for the event can be found here. Hope to see members of the SFACFE there!